“Colorado Music” celebrates the sights and sounds of important Colorado-rooted musicians and industry leaders who’ve made a significant impact to the national and international music scene. In partnership with the Colorado Music Hall of Fame presented by Comfort Dental and the John Denver Estate, “Colorado Music” provides an unprecedented opportunity to see unique, rare and significant objects from a multitude of music legends including John Denver, Glenn Miller, Joe Walsh, Big Head Todd & The Monsters and Chris Daniels. Instruments, records, sheet music, handwritten lyrics, photography, costumes and other extraordinary displays help illustrate and personalize the pathways to sweet musical success for the roughly 25 featured musicians and music legends. The Colorado Music Hall of Fame presented by Comfort Dental, located at the Trading Post at Red Rocks Amphitheatre in Morrison, was created to educate the public regarding everything that’s great about our state’s music. With a current inductee list of 22, the hall honors the artists and individuals who have defined Colorado’s amazing and diverse musical legacy. 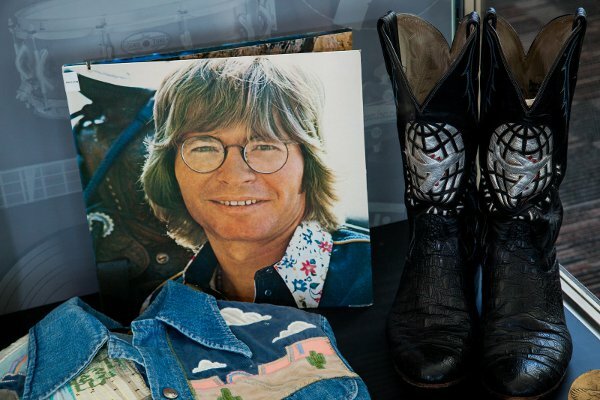 John Denver was one of the world’s best-known and loved performers and earned international acclaim as a songwriter, performer, actor, environmentalist and humanitarian. Denver’s career spanned four decades and his music has outlasted countless musical trends and garnered numerous awards and honors.